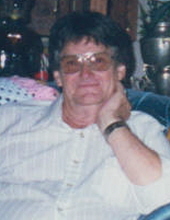 James A. Garfield Campbell, age 80, of Hazard, KY passed away on April 01, 2019 at his residence. James was a retired brick layer. He was born on April 25, 1938 to the late Garfield Campbell and the late Nancy Hicks Campbell. He is also preceded in death by three brothers: Wilson Campbell, Burchell Campbell & LR Campbell. He is survived by his wife: Nella Rose Johnson Campbell; one son: James Campbell Jr. of Perryville, KY; one brother: Earl Campbell of Ohio; three sisters: Viola Combs of Frogtown, KY, Beatrice Osborne of Ohio & Gracie Osborne of Ohio along with a host of nieces, nephews, family & friends. To send flowers or a remembrance gift to the family of James A. Garfield Campbell, please visit our Tribute Store. "Email Address" would like to share the life celebration of James A. Garfield Campbell. Click on the "link" to go to share a favorite memory or leave a condolence message for the family.